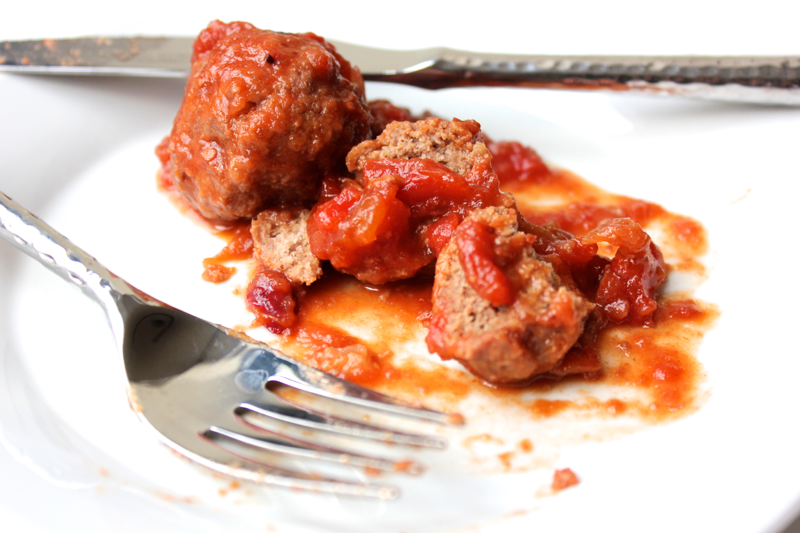 My mom’s sweet and sour meatballs have been around for a long time, but I never really liked them. Now that my aversion to ground meat has mostly subsided, I opened myself to the possibility of trying them again. And then David started expressing his desire for Swedish meatballs (which he last had at Ikea when we moved apartments a few years ago). And then I was talking to my mom and trying to come up with a slow-cooked, make-ahead meal that would reheat nicely during the week, and she suggested her sweet and sour meatball recipe. I bit, figuratively and then literally. The meatballs are fantastic and versatile, and you should be more open to trying them than I have been for the last 20 years. To make these meatballs, begin with cranberry sauce. 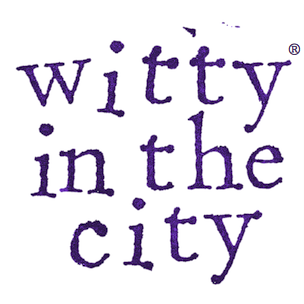 You can either get a 16 ounce can (my mom prefers the whole berry kind over the jelly kind) or you can make your own. Trader Joe’s doesn’t sell cranberry sauce, but I had a few bags of cranberries stockpiled in my freezer so I just made my own (it’s not burdensome at all!). To make your own, add 12 ounces of cranberries to a pot along with 6 ounces of sugar and a little bit of water to get things cooking. 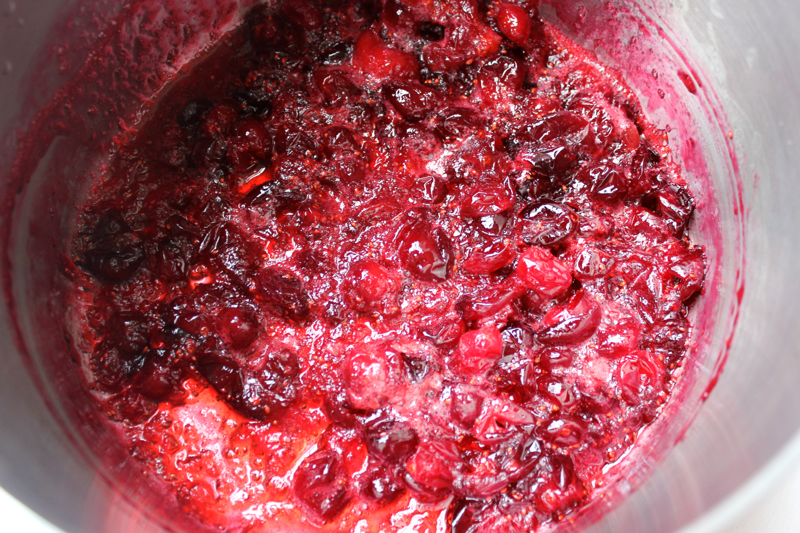 Simmer the cranberries until they pop and the liquid thickens up- about 10 minutes. If you’re using the canned sauce, put it in the pot and heat it until it melts. To the pot, add a 24 ounce can of tomato sauce or diced tomatoes. 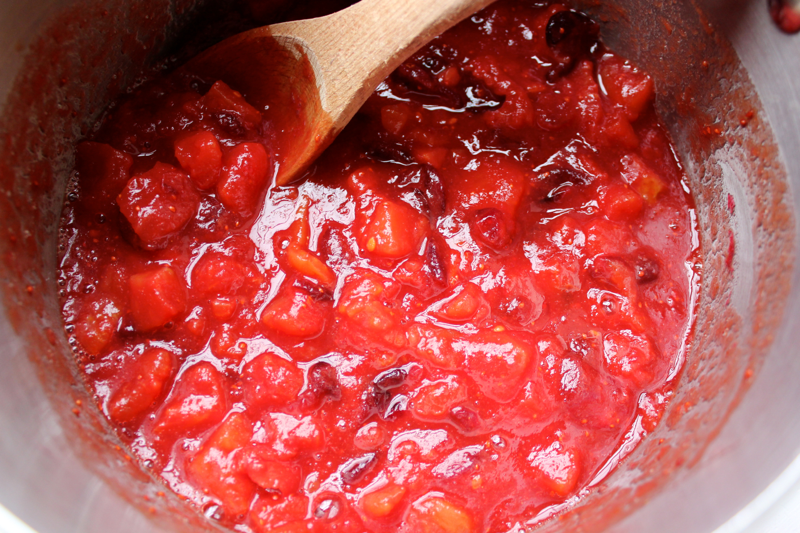 Simmer the sauce and then taste it’s sweet and sour balance. Adjust the balance with sugar or lemon juice as needed. While the sauce warms, make your meatballs. 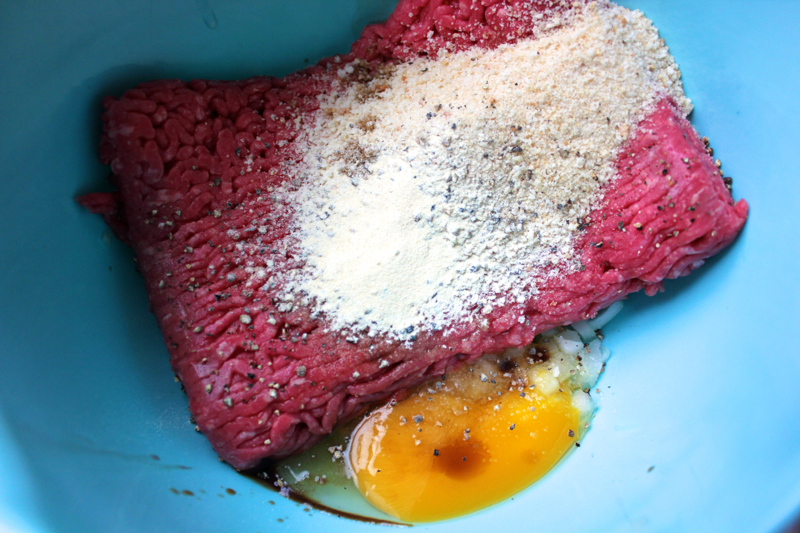 In a bowl, mix together 1 pound of ground beef (my mom uses ground turkey but I still really hate that), 1 egg, 1/4 cup of breadcrumbs, 1/4 cup of minced onion, salt and pepper, 1 tablespoon of garlic powder, and 1 teaspoon of Worcestershire sauce. It’s easiest to mix the meat with your hands. Yum. Form the meat mixture into 2-inch balls. Both my mom and I were able to make 20- go consistency! 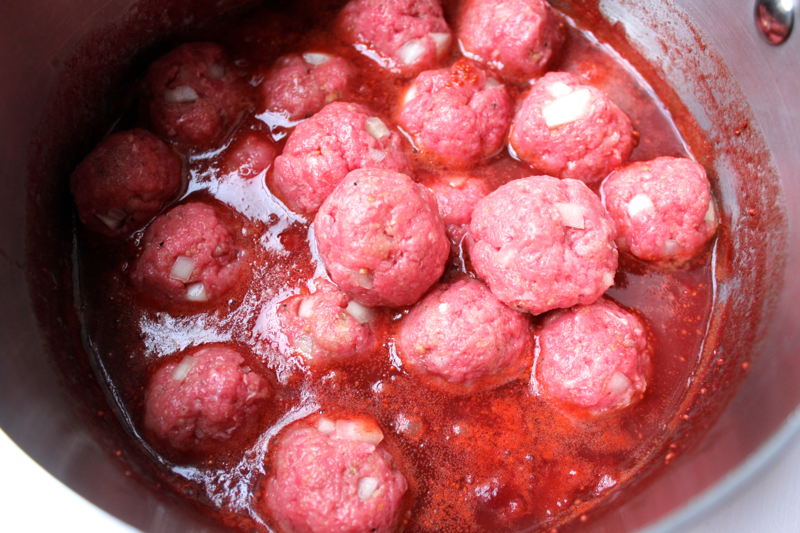 Add the meatballs into the sauce, and cover the pot. 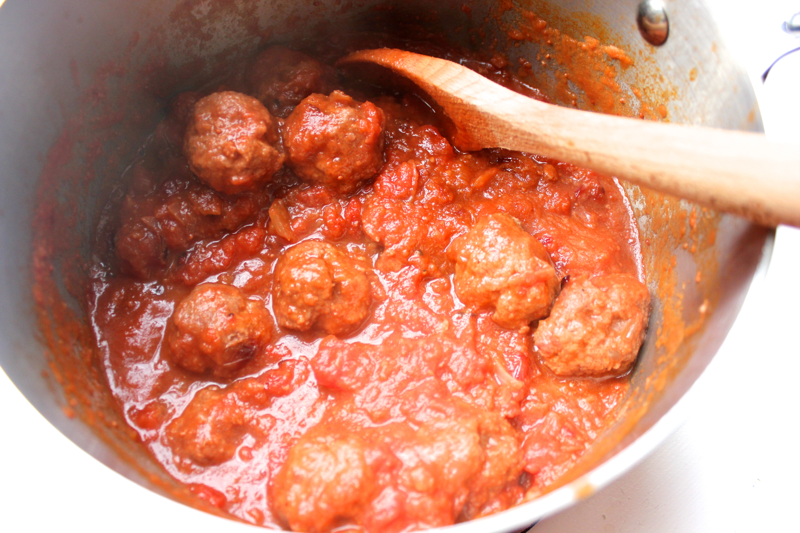 Simmer the meatballs for about 70 minutes, stirring them around a couple of times for even cooking. 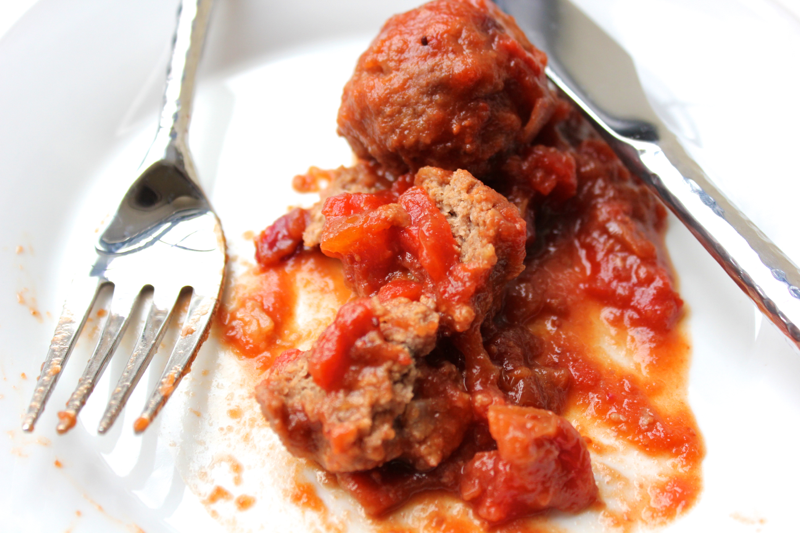 These meatballs are great to eat alone, on a roll for a meatball sandwich, or over noddles. We ate them all three ways, and I think the sandwich was my favorite. My mom says these meatballs are also good for Passover sliced in half and eaten on matzah if you make them with matzah meal instead of breadcrumbs. Best of all, these meatballs are just as good reheated, so they’re the perfect thing to make on a lazy Sunday and eat at the end of a busy weekday. Go balls! Thanks much for the recipe. They’re simmering right now and smell wonderful! Must be good served with rice and pasta. Really delish over egg noodles or bow ties. Yummy with mashed potatoes too! !